A baby elephant named Themba was orphaned after his mother fell off a cliff. He was closely monitored and the keepers were hoping that he would be adopted by another mother. But, after a week, he was still left alone. They took him to the Shamwari Wildlife Rehabilitation Center, where he was introduced to Albert, a sheep. Themba charged up to Albert and scared him. Albert hid in a cave for twelve hours, but the persistent of Themba finally won over Albert and he emerged. They became fast friends after that and have not been seen apart ever since. Dr Johan Joubert, the centre's wildlife director, said the robust sheep could handle rough-and-tumble with Themba much better than the human staff. He added: 'Albert is like a brother to Themba and he is definitely an important member of Themba's herd. 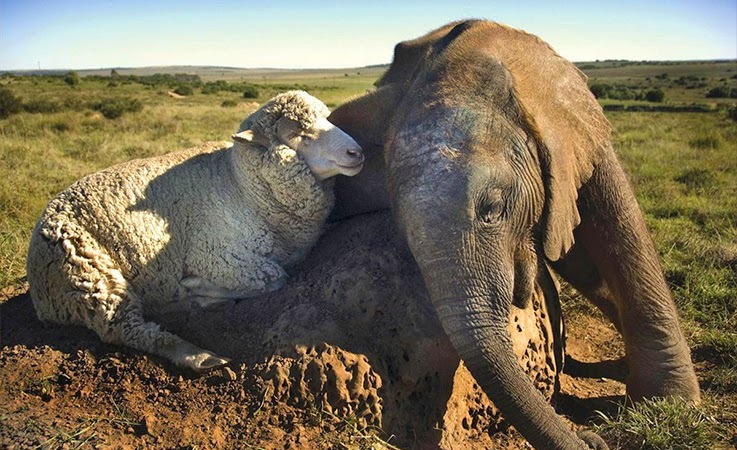 Responses to "Orphaned baby elephant and Albert the sheep are Best Friends "